Cryptocurrency is the latest craze. From a time where only a few technical geeks knew about it, we are now at a time where almost all individuals below the age of 50 know about it. There are thousands of success stories about individuals who invested in bitcoin and overnight turned into millionaires. From the initial 22 dollars per bitcoin in early quarter of 2013 to its highest of over 20,000 dollars per bitcoin to the current 6,800 dollars per bitcoin; to say the bitcoin price has been a roller coaster ride is an understatement. There is no wonder that bitcoin and blockchain is one of the hottest commodities at the present time and this trend is set to continue as an increasing number of the population learns about bitcoin, altcoins and blockchains in general. Bitcoin, blockchain and cryptocurrencies in general have a great future ahead of them. As such, businesses and startups that revolve around bitcoin, blockchain and cryptocurrencies have a great and bright future as well. One such great business idea with a great potential and a bright future is to set up a cryptocurrency exchange. Depending on your dedication and capabilities, you can easily turn your whole life around by starting a cryptocurrency exchange. So why is everybody not setting up their own cryptocurrency exchange? Well, the truth of the matter is, setting up your own cryptocurrency exchange is very hard work. You will need to employ a team of blockchain experts who work for months before your platform is up and running. You will need to do constant maintenance as well as hire a tech guy who can deal with your platform testing as well as sort out various bugs that you might encounter. Due to how lucrative the cryptocurrency business, your platform will constantly be under attack from hackers looking for easy money. You will need top notch security as a result. Your profit is further more, directly affected by the volume of transactions that you do and as such it is very important to amend various features on your cryptocurrency exchange to rope in and maintain a great number of customers. Even with a full staff of experts, you might even fail with your cryptocurrency exchange ventures. Everyone knows that for great reward comes with great risks. However, using bitexchange.system, you can reduce your risk and save your investments. Bit exchange systems provides a ready-made cryptocurrency exchange script for free. Now, I know that whenever you encounter the word ‘free’ on the internet, you might scoff and tell me that it is never the case on the internet. Internet has made all of us cynical with all its bogus claims. But I assure you that what I am writing about is completely true. Incase you are worried about the security of the free script, you can hire a blockchain expert to go through all the script. Bit exchange systems provides the full source code and assure you that their product is completely authentic. The security of your cryptocurrency exchange is the most important aspect of your product and the team of expert at bit exchange systems takes the issue of security very seriously. Whether it is on the technology/code front or on the exchange platform front; they have it locked as secure as fort knox. Additionally you can add features such as Atomic swap (atomic cross-chain trading) as a means to attract more customers. Usually when you wish to change one cryptocurrency with another (let’s say from bitcoin to Ethereum), you will need to first exchange your cryptocurrency (bitcoin) into normal currency; then use the normal currency to buy the other cryptocurrency (Ethereum). Usually, when you exchange your cryptocurrency you will need to pay a transaction fee. With Atomic swap, you can directly trade with others directly. This means that you can directly trade your bitcoin into alt coins or vice versa without paying a transaction fee. 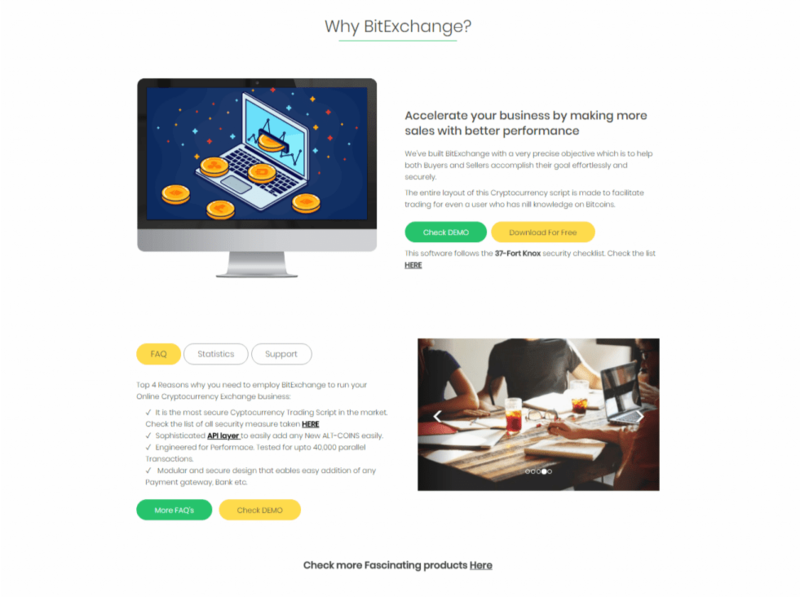 There are various other modules that bitexchange.systems provide that can be added seamlessly into your new cryptocurrency exchange or even existing exchanges. So, what are you waiting for? Go to their website and check it out!